Whether you’re an archer, hunter or shooter, a must have accessory is a laser rangefinder. A laser rangefinder allows you to quickly get accurate measurements of distance between you and your target, with the simple push of a button. With all of the changes and advancements to rangefinder technology, you might think that they are way out of your price range. For most of us, this is no longer the case! With entry level units starting at just over $100, almost any serious shooter can afford to add one to the tool belt. 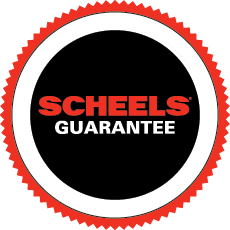 Customers will be familiar with the brands they see in a SCHEELS rangefinder display case. Many of these units are built to match a particular brand’s customer base. In most of our stores you will find units from Nikon, Leupold, Vortex, Sig Sauer, Swarovski and Leica. When you are shopping for a range finder, the two most important pieces of information you need to know are – what is your target and what is the maximum distance you need to accurately display. Not all range finders are created equal and most companies rate their product in a manner that reflects the units ability to range reflective target in low light. If the target to be ranged is non-reflective (or in bright light), the range finder’s ability to get an accurate reading will be significantly reduced. A good rule of thumb when purchasing a rangefinder is to cut the units reflective/advertised rating by 40% to 50%. For example, if you are a hunter and you want to range a deer at 500 yards, you should buy a rangefinder rated for a minimum of 1,000 yards. If you are a target shooter and need a rangefinder that is capable of reading a steel target at 800 yards, you should look for a unit rated for a minimum of 1,500 yards. If you keep this distance formula in mind you will be happy with your units range finding ability. Some of the nicer rangefinders come with significant upgrades. These upgrades can be as simple as a lifetime warranty (Vortex) or an illuminated lcd reticle to aid in aiming in low light conditions. The most effective rangefinders will include technology that allows for the rangefinder to give you a more accurate distance when you range up or down hill. These rangefinders take the angle of the shot and apply a geometric formula to give you a distance that is more realistic to the conditions. The top of the line units often come with a built in ballistic calculator. Options from Leica, Sig, G7 and many others allow you to input your particular ballistic information into the unit. Then when you range a target, the unit provides you with an accurate firing solution. These units are so sensitive that they take into account many factors, including air pressure, direction of fire, election and any incline/decline. These units help to extend a shooters maximum effective range by providing in the field ballistic data in a very user friendly format. For the minimalist hunters/shooters, vendors started integrating their rangefinder into a quality binocular. Currently these units are available in several price points and are made by many of the top manufacturers, including Vortex, Leica and Swarovski. These units allow you to glass with a premium optic and range the distance at any point in time during the process. You simply find the target, hit one button to bring up your aiming reticle and hit it again to get an accurate range. Precision Shooting Expert and Instructor Cory Rigby shares his years of knowledge on new products and how to apply them to your passion. It takes practice to get an accurate range with your rangefinder, so take it out a few times before you “need it” and gain some valuable experience. A fresh battery can make all the difference. Never start a season or take an important trip without putting in a new battery. Be sure to always have a backup as well. Most units will perform their best for the first 200-300 reads on a battery. You can’t range through snow, rain, fog or any other disturbance in the air. If you wouldn’t shoot the target “off hand” do not range it “off hand”. Support your rangefinder the same way you would your rifle. I recommend a good set of shooting sticks or even a tripod for the long range crowd. Never range a target just once. Always range the target several times to ensure you have an accurate range. Thanks for the updates and review for rangefinders, I want to know which one should i buy for hunting purpose any idea? Thank you for reaching out. We need a little bit more information to appropriately answer your question. Can you please provide some more information? 1.What type of hunting? Archery or Bow? 2. Longest range you would expect the unit to range 100% of the time? 3.Do you have a brand preference? Please provide more details and we would be happy to help narrow down your options.